Just a few years ago, the Dubai government set a very aggressive vision to compete with the major cities of the world, and to stand out as the leading trade hub in the Middle East. This left Dubai Customs with no choice but to evolve and transform. The characteristics of the environment when this transformation started was by no means favourable. Dubai Customs was a traditional paper-based organization. There were about 1,500 employees, processing about two million Customs declarations per year. The information technology (IT) functions were limited to basic software development, using traditional technologies. According to a diagnostic study undertaken by the WCO in 2002, while Dubai Customs offered a number of services, the operating environment did not meet the expectations of the international trade supply chain, nor did it enable the administration to fulfil its obligations towards the protection of the local economy and society. Between 2002 and 2005, some activities aimed at responding to the WCO diagnostic study were undertaken, but these actions were not based on a full understanding of the future needs of Dubai. In 2006, Dubai Customs launched a larger Reform and Modernization Programme (RMP) to transform the organization from a paper-based administration into an electronic enabled, paperless, world leading administration in the field of digital services. The first task undertaken under the RMP was to establish a full understanding of what was needed for the future of Dubai, and to identify the gaps between Dubai Customs’ current environment, and the ‘Customs of the future’ envisioned by the organization. To do so, the current state of the organization was assessed – the performance of its operations was determined, notably by calculating the time that it took to clear goods from airports and seaports, and the amount of documentation that had to be supplied. A study on what Dubai would look like in 2010 and in 2015 was also undertaken. The study predicted that by 2010 declarations would grow by 400%, and passenger traffic by 300%. To support this growth without reforming the then existing operating model meant that Dubai Customs would have to increase its staff numbers from 1,500 to 6,000 by 2010. Moreover, there was a need for increased efficiency of ports and airport operations if existing clearance times were maintained. In the initial planning phase, it was thought that all Dubai Customs would have to do to meet the challenges of this future environment would be to introduce new technology systems. But it was very quickly realized that, in order to implement a sustainable solution, Dubai Customs needed to change the basic premise of its operations with the consequential impact on the organization’s operating model and the way its staff worked. the Dubai government (the transformation of all services to electronic/mobile services, and the creation of an executive service ‘dashboard’ which enables directors to monitor the performance of their teams and the quality of the service delivery). Establishing a new operating model that would incorporate the above-mentioned WCO recommendations on risk management as well as Dubai government directives, in order to ensure full understanding of the transformation initiatives by all concerned operational units. This operating model has been the building block for the entire organization’s transformation, and is driven by four core enablers: people; processes; technology; and information. Establishing a legislative infrastructure by the creation of business units dedicated to setting and enforcing legislation, notably a legal department (to handle the interpretation of laws and represent Dubai Customs in lawsuits), a compliance unit, a post-clearance audit unit, and a policies and notices unit (to issue Customs policies and notices that are aligned to laws and legislation). Defining working methodologies in areas such as project management, business process management, and service management. Revamping IT functions into a state-of-the-art business unit that would be capable of supporting the transformation of the entire organization towards full automation. This required rigorous structural re-engineering and automation of Customs processes, by implementing global best practices in IT integration, governance and management in order to optimize efficiencies. Modifying the organizational structure, ensuring the availability of qualified staff for each practice area, and ensuring the effectiveness of the structure through a defined framework for monitoring, assessing, and refining organizational structures. The main challenges that Dubai Customs has met along the way towards the transformation of its organization included having to set the legislative reference. For example, Customs policies had to be identified and modified to allow paperless transactions. Yet, the biggest challenge was changing peoples’ mindset, and gaining traction amongst employees. Dubai Customs worked very closely with its Human Resources Department to mitigate resistance to change by defining and applying a framework for managing change, as well as resistance to change. In terms of achievements, figures 1 to 4 illustrate the delivered results of the transformation enablers that are tied directly to Customs’ core mission and objectives, namely facilitating trade and protecting society. Dubai Customs launched a paperless Customs clearance system, known as Mirsal 2, in March 2010. This advanced Customs system allows the electronic clearance of simple declarations through the internet in less than two minutes, without the need to submit any papers before the arrival of goods. Mirsal 2 is a combination of IT services. The system manages all operations, including the collection of Customs duties. It also manages the risk management cycle. The main uniqueness about the product is that clients are able to electronically sign their declarations by using a digital certificate. Added to this, it is connected to other entities that form part of the trade supply chain within Dubai, meaning that information about the declaration is seamlessly exchanged amongst these entities, thereby allowing for faster processing of goods and cargo. Availability to submit different requests through a full-fledged file or by connecting the client’s systems to the Customs system, which can be very beneficial in cases where there are many invoices and goods that need to be cleared in one request. 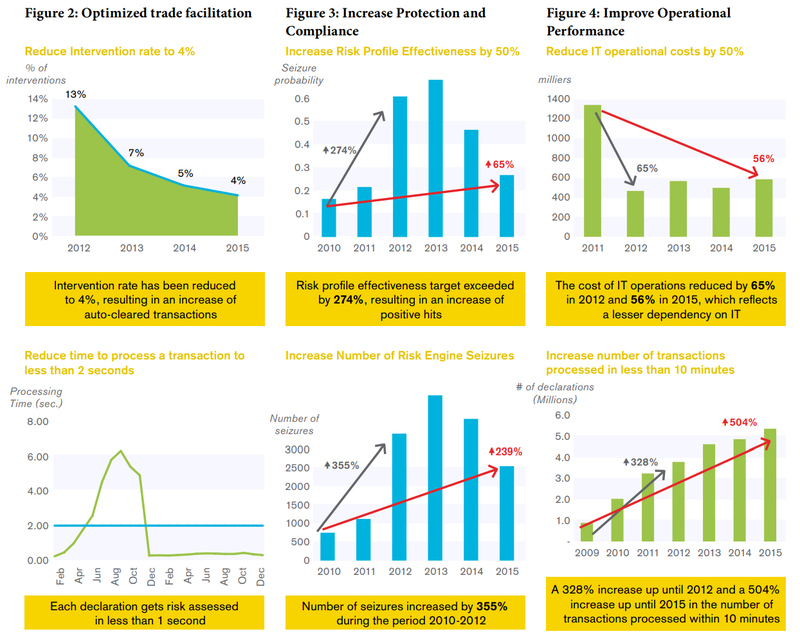 Improved collection of trade statistics and data used, to develop strategic planning in the region. Developed in-house by Dubai Customs, the ‘risk assessment engine’ is considered to be the ‘beating heart’ of Mirsal 2. 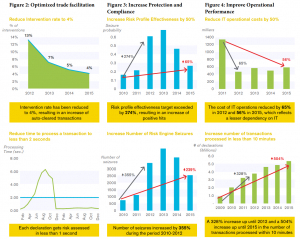 This integrated smart system, which stands out as a reference model worldwide, assesses Customs transactions according to pre-defined risk profiles. These risk profiles are loaded into the system following the linking and analysis of intelligence gathered from various channels. As per the risk engine, all transactions flagged as risky are routed for further risk mitigation and inspection. Consignments cleared in less than 10 minutes have increased by 328%; and now represent 82% of all Customs transactions. The risk assessment engine has also helped to reduce the time required for risk assessment to less than two seconds, which means that 97% of non-suspect transactions are cleared automatically in less than one minute from the time the consignment data is logged. The Advanced Container Scanning (ACS) System combines X-ray and radiation scanning inspection technologies. The device is capable of screening the contents of 150 trucks per hour moving at 8 to 15 km per hour – that is one truck every 24 seconds. What is unique about the ACS System is its integration with the Customs inspection and clearance systems. An inspector using the ACS System can access data from the risk engine directly from his workstation, in order to check why a scanned shipment has been selected for inspection. He can also access the declaration, in order to compare the scanned image with the shipment details. The implementation of this technology contributed to an increase in the compliance rate at Jebel Ali Port from 42% in 2010 to 91.7% in 2013, a reduction in the time taken for the total inspection from two hours to 20 minutes per container, and a drop in the costs involved by 54%. Last but not least, the number of Customs’ clients at Jebel Ali increased by 33% during the 2010 to 2013 period. In line with the vision for Dubai espoused by His Highness Sheikh Mohamed Bin Rashid Al Maktoum, Vice President and Prime Minister of the United Arab Emirates (UAE) and Ruler of Dubai, the Dubai government launched the Dubai Smart Government (DSG) Strategy in June 2014. It consists of four major areas and sets out 21 strategic objectives aimed at making customers happy, and at enhancing their confidence in the adoption of ‘smart government’ services. All of Dubai Customs’ services have been eEnabled since 2009 and mEnabled since 2013. Despite the remarkable drastic transformation undertaken by Customs over the last few years, there is still much work to be done to cope with today’s ever-changing and increasingly globalized world. In early 2015, Customs launched the ‘smart version’ of its Transformation Strategy, fully aligned with the Dubai Plan 2021 (a visionary plan for the Emirate up to 2021) and the DSG Strategy. 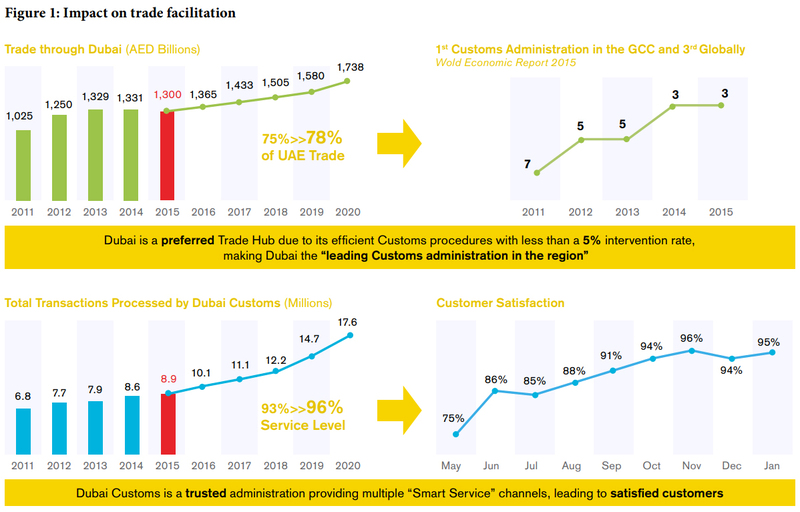 Customs defines ‘smart transformation’ as an intelligent approach to delivering services to traders and customers in a faster, more accessible, and more cost-efficient way. The Smart Transformation Strategy of Dubai Customs lays the foundation for future innovation, and focuses on service modernization, improving user experience, technological innovation, increasing efficiency, and reducing costs. Dubai Customs’ handling of the flow of goods, people and conveyances across borders can be done in a better way if it uses the right technology and has the right human capabilities. Work is underway, in collaboration with its stakeholders in the trade and security supply chains, to adopt enabling information and communication technologies (ICT), like ‘big data,’ open data, mobile technologies and cloud computing, to help drive connectivity among border agencies and with trade operators. Predictive service – specific decisions usually initiate specific procedures. For example, if an inspection is required, the client is notified by way of an inspection booking request. In this context, thanks to the predictive service functionality, the system will automatically create a draft message. Dubai Customs is also working on ‘smart inspection glasses’ that will allow inspectors to upload cargo declarations, and visualize scanned images of the cargo and other relevant documents, just like they do on their smartphones and tablets. They will also be able to enter inspection reports through their smart inspection glasses, using voice commands or a virtual keyboard. 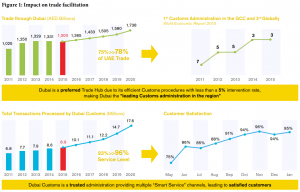 The approach to transformation by Dubai Customs is unique and innovative, particularly in how it smartly combines several transformation enablers. This approach could act as a reference point or blueprint for other Customs administrations and border agencies, and potentially for other industries as well. It is worth mentioning that the UAE federal government plans to leverage Dubai Customs’ approach to risk management and risk mitigation in other government organizations.